People don’t realise what is going on in Twizel. That’s the belief of Chris White, a Dallas-domiciled Kiwi with a passion for the former hydro town. In fact, he describes it as genuinely being a “hidden gem”. The Mackenzie town has left behind the hydro days, when it was constructed as the temporary base for the Upper Waitaki Power Development, with new housing springing up all over the place and people falling for its charms. “I’m a little bit sick of it being known as a dam town now. It’s moved on. You want to see the people that are holidaying here. There’s a real underbelly … of really smart intellect and talent moving in here and holidaying here. People want to get out of the rat race,” he said. . . The Ministry is doubtless looking at what constrains growth. 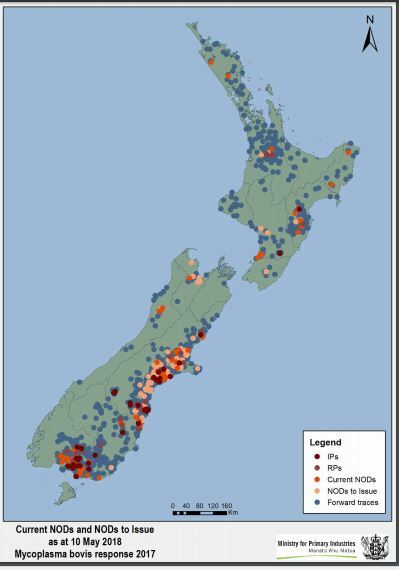 In the last and current seasons, the cold and wet was followed by hot and dry, in turn followed by heavy rain from cyclones, has hindered production across the country, particularly in the North Island and the top of the South Island. Productivity has been significantly down, and this has been seen by consumers in the increased price for some vegetables due to short supply. Although there appears to be more of these extreme climatic episodes affecting production, the last year and a half has been particularly difficult. A return to more normal weather patterns will see a return to more normal production levels, and higher levels of growth. . . The milk is mostly sourced from Theland’s Tahi Farms – formerly Crafar Farms – and processed by Green Valley Dairy in South Auckland. . .
Auckland isn’t the first word that usually springs to mind when discussing the future of farming in New Zealand. It’s the city of sails, motorways and high rises, after all. But our biggest city holds the key to the Government’s goal of doubling primary industry exports in real terms from $32 billion in 2012 to $64 billion by 2025. To achieve this ambitious goal people are the key – not just to expand the workforce of our primary industries, but to replace retiring baby boomers. . . This supports research conducted by the Australian Farm Institute, which indicated a 25-per-cent increase in the gross productivity of farming outputs could be achieved through the adoption of digital technologies. The USQ research follows a 2015 landmark agreement, where the Barcoo and Diamantina Shires successfully lobbied to have fibre optic cable and mobile coverage connected to the remote communities of Birdsville, Bedourie, Jundah, Stonehenge and Windorah. . .
Durum wheat varieties can withstand 40C heat along the Senegal River basin, and could produce 600,000 tonnes of food. Following four years of trials, which saw thousands of wheat varieties tested in the unforgiving sub-Saharan heat, scientists have successfully turned what was first thought of as a “crazy idea” into a vital new food crop. With more than 1 million smallholders living along the Senegal River basin, which also runs through Mali and Mauritania, it was an important strategic area to trial the wheat. . .